Won Best Poet in Readers Poll! 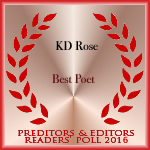 Thank you to all who voted in the readers poll and to Preditors and Editors! I won best poet!